I leaned against the seat and watched as passengers streamed in to find their places in this Boeing 787 flight bound for Europe. Having failed my first and only attempt for a business class seat, I tested the recline button, relieved that British Airways gives a far better lean than Spirit Airlines. At least I should sleep some, I muttered to myself. My attempt for business class was motivated by my friend Bob’s confident prayer while meeting over coffee the week before. I shared with him how I dislike traveling, especially the overnight trips to Europe, thus his prayer. His hand rested on my shoulder, our heads bowed, and Bob’s faith-laced prayer moved me, and filled me with hope. Especially the part that the Lord miraculously provide me a business class seat on that plane. When I checked in at the gate and asked for availability in business, the agent chuckled and said, “Well you can try flirting with the flight attendant.” “No I would never do that,” I snapped with an air of spirituality. “I’ll just ask nicely.” And I did ask the male flight attendant, who informed me they can’t do that anymore, even when business class has many empty seats. And it did! So, I settled for 27-D, two rows into the general seating with a great view of the five empty rows in business. I leaned back again as the cabin filled with people from every part of the world, all so different, now bound for a common place. All hope was dashed at the sight of the young couple making their way through business class, only a thin curtain and four more rows separating us. A wiggly, already screaming toddler dangled from the father’s arm. They inched my way, and I glanced at them and then at the empty row in front of me. No, please, no! I muttered, every muscle in my body tensing at the now very limited possibilities available to them. Keep walking, that’s it, keep walking my hands gripped the arms of the chair. I assumed the crash position. No, no, I screamed silently. All hope is lost. No sleep, again! The chairs bounced in front of me as the family jostled into their places. A sound and movement to my left distracted me from the family, and the screams of the toddler faded to background noise. A large man, no less than three hundred pounds wedged his body past 27A and plopped next to me in seat 27C, the plane bounced for just a second. 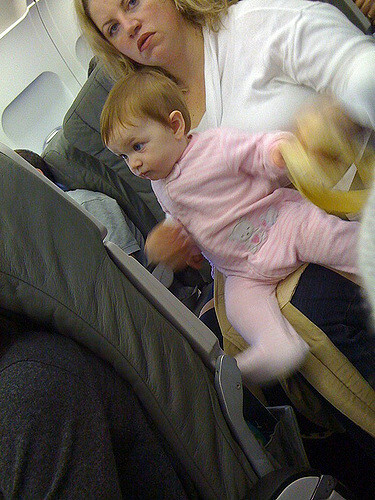 The portly man settled, looked at me and smiled, but then leaned in and said, “Can’t believe we have to sit behind a screaming baby.” I forced a grin and muttered, “Yes, a shame indeed,” but I was more worried about him now than the baby. I wanted to say, Hey buddy my seat is too small for the two of us, but refrained and went back to praying, this time that God would just let me survive the trip. Many were praying for me on this trip knowing its importance for the kingdom and many agreed with me that a healthy Mitch was an essential component to the success of this mission. Prayers were very specific, with little chance of God misunderstanding what we wanted. I needed to sleep well, be healthy for the week and serve at the top of my game. I barely slept, and it was my own coughing that seemed to wake me more than the crying of the baby. The heavy snoring of the man next to me, still sharing my seat, did not help. An hour into my three-hour-layover in London, I decided to purchase a thermometer at Boots Pharmacy. I ripped the package opened, took the instrument out and placed it in my mouth. 102 degrees Fahrenheit. And so my week began, and actually continued, in weakness. With a fever, having slept little and every specific prayer NOT answered. Our lives all fit in the backdrop of Job’s story, who by the end, after one litany of complaint after an other over all God’s failures to provide, we are forced to stand in awe of him and say, I know that my redeemer lives, and that in the end he will stand on the earth. (Job. 19:25). And God reminds us, as he reminded Job and his praying friends, “Where were you when I laid the foundation of the earth? Tell me if you have understanding.” (Job. 38:4) And “Have you entered into the springs of the sea Or walked in the recesses of the deep? “Have the gates of death been revealed to you, Or have you seen the gates of deep darkness. “Have you understood the expanse of the earth. Tell Me, if you know all this.” (Job 38:16-18). Wow, talk about being put in one’s place. By not answering my specific prayers, I had a strange encounter with prayer. I am more cared for, and protected and provided for than I ever thought. Jesus’s prayer to his Father is being answered daily just in the fact that I am still alive, and breathing and able to do what I do. I am protected from the enemy, kept from temptation and delivered from evil because God answers prayer, Jesus’s prayer, our prayers. When the focus of my prayer is more about His kingdom, than it is my own, something in me wakes up. I realize he owes me nothing, but still fills me with everything that is good. And sometimes all those things that are so good, and awesome about him, show up in the moment when I do not get exactly what I am asking for. Unanswered prayer introduced me to the mystery and awe and holiness of God and his delight in being my God. Strange isn’t it? It is when God doesn’t answer specifically what you are asking from him, that you find yourself more in awe of him.